WILLIAM PAINE. Partially Printed Document Signed as company president. 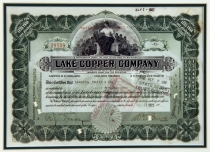 100,000 shares of Lake Copper Company, Certificate #28509, March 10, 1922. Certificate #28509. 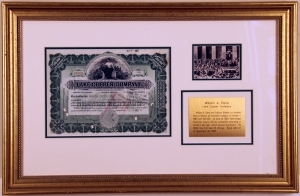 William A. Paine and Wallace C. Webber opened a brokerage firm in Boston in 1879. Today, PaineWebber is a full-service securities firm whose principal lines of business include retail brokerage, investment and merchant banking, trading, and asset management. It has headquarters in Midtown Manhattan and New Jersey. Financier Paine acquired a stake in the iron-ore mountain ranges of Northern Michigan through interests in the Lake Copper Company and other mining companies.